We are well into the New Year now and almost at the end of January. Where did the time go? January is typically a month of resolutions, aims and goals. And a lot of the time they focus on losing weight, getting fit, starting a new hobby. Did you make any resolutions? For us at Talk to Mums, it’s more about adopting lifestyle changes that we can maintain. It’s about creating good habits that will stick through 2019 and not come to an end before February begins. This is why we’re very excited to introduce our readers to Hula Hoops Puft, the perfect addition to a healthy, balanced diet. Our Talk to Mums Mumbassadors are handing out Hula Hoops Puft over the next couple of weeks. Flavours we’re handing out are salted and beef. Be sure to follow the hashtag #hulahoopspuftt2m on social media to find out what our mums think. What are Hula Hoops Puft? You may already be familiar with Hula Hoops. You know, the snacks you can pop onto your fingers?! 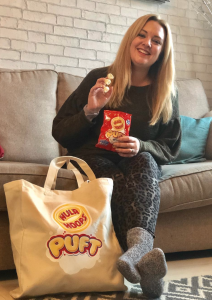 Well Hula Hoops Puft are the lighter version, offering women even more variety when it comes to healthy snacks. They’re light, crispy and only 72 calories per 15gram bag. And they still fit well on fingers! Hula Hoops Puft are cooked using 100% sunflower oil and are completely free from all artificial flavours, colours and MSG. They’re suitable for vegetarians and come in a variety of flavours. I can’t believe these are only 72 calories based on how great they taste! The great thing about Hula Hoops Puft is that they are only 72 calories a bag. This is a massive plus for the mums we’ve spoken to because they can enjoy them as part of their regular lifestyle. Can we get some quotes in from the sampling? I enjoy Hula Hoops Puft as a guilt-free treat. At 72 calories I don’t feel guilty. Hula Hoops Puft are available in all the major supermarkets – Tesco, Asda, Sainsbury’s, Morrisons, Co-op and Waitrose, as well as online. They are typically £1.70 for a pack of six. Keep an eye out though as they are often on offer.